Discussion in 'Gaming (Software and Graphics Cards)' started by Cloudfire, May 9, 2015. Hasee, a big chinese notebook manufacturer, had a conference in china few days ago. 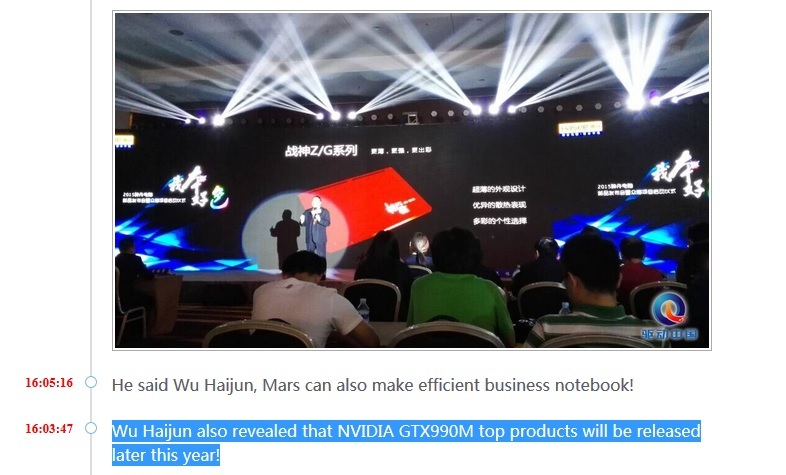 Wu Haijun, the CEO of Hasee revealed that GTX 990M is coming in Q4 (September - December). Probably close to September to not put it too close to Pascal (June 2016 ish). And the biggest news is that GTX 990M will be just about as powerful as GTX 980M SLI! GTX 980 with 2048 cores have a TDP of 165W. Meaning a desktop GPU with 2500 cores will be around 190W. GTX 680 with 1536 cores was 195W, and we got GTX 780M with 1536 cores from that one. Yes I know GM200 is 384bit, but if they can`t that to work with GTX 990M, they have disabled 4 memory controllers and it will be 256bit. Daniel1983, 1nstance, Robbo99999 and 8 others like this. A single mobile GPU based on Maxwell that performs like a GTX Titan X? Sounds way too good to be true. I'd be able to believe that if it were Pascal. But I suppose if it is true, that's damn impressive, and I want one. 1nstance, MogRules, moviemarketing and 1 other person like this. 990M would have to outperform Titan X because 980M SLI already does. Disable all those ROP & MC partitions in GM200 to make a 256-bit mobile GPU and you no longer have anything close to resembling Titan X performance. And then there's the little matter of fitting a 600mm^2 die inside a notebook. So technically, not only would 990M have to be an overclocked full fat GM200, it would have to be somehow scaled down from 250W to 100-125W at the same time. Philsko, D2 Ultima and sasuke256 like this. With these HQ cpu's i dont see any point to more powerful gpu's right now. The current lineup of intel CPU's are bottlenecking the hell out of them. woodzstack and D2 Ultima like this. It's fun to think about, though. Even if this isn't true, we can expect to see similar performance output from the 1080M (Pascal). Just imagine that, guys. It's going to be great. That was my immediate reaction as well. I wonder if Skylake HQ will be fixed... It actually looks like it might be worse. The GT80 is a weird case. Since it is such a large machine and has the cooling capability, MSI unleashed the core. The problem is that signs are pointing to Skylake being higher TDP than Haswell at the same clocks (the 4GHz desktop part is said to be 95W TDP when the 4GHz 4790k is rated for 88W TDP) which is worrying for mobile to say the least. GTX Titan X is probably 10-15% faster than 980M SLI in average over a big set of games. 3072 cores - 15% is 2600 cores. Pretty close to the 2500 core GM200 it could be. 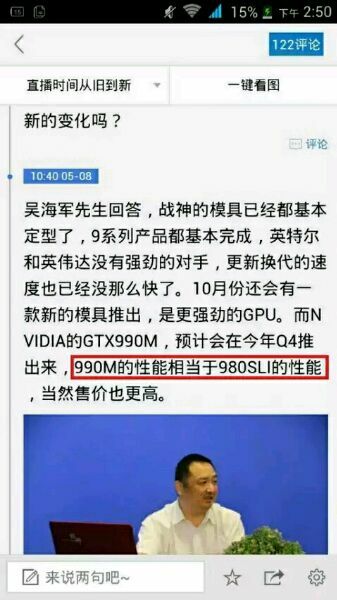 Im not saying GTX 990M is 980M SLI. Hasee is. Read the first post. The TDP will go down to around GTX 780M if they disable memory controllers. Its only 500 more cores than GTX 980. Its a pretty wild thing to think about. I was certaim we would see a full GM204 instead. I don't see how this is possible. GM200 is too big for mobile and it makes absolutely zero financial sense for nVidia to release something so powerful now that AMD has bowed out of the race. It just would make expectations for Pascal even higher. I really can't see such a performance jump without competition being a driving force. another photoguy, Apr 14, 2019, in forum: What Notebook Should I Buy?